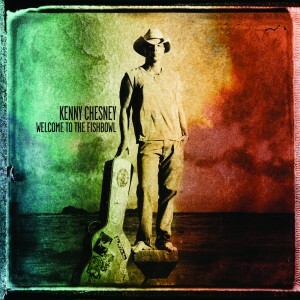 Kenny Chesney’s Welcome to the Fishbowl is an album of love, loss, regret, resignation and loneliness. It’s a far cry from the “no shoes, no shirt, no problems”, beach lifestyle songs we are oh so familiar with (and sometimes love so much). This CD of 12 songs – his 15th studio album – has Chesney’s same sweet melodic voice that we know and love but the songs have an abundance of the sadder, darker side of life compared with his happier, party on the beach “Follow me, everything is all right….” songs. There are a few noteworthy songs such as Feel Like a Rock Star his duet with Tim McGraw and You and Tequila (with Grace Potter) and the previously released Come Over which is a very pretty song. The other songs are good , pretty and well written but they are the kind of songs that if country fans start to hear them on the radio, the station will get changed. Not because the songs are bad but because they’re mood changin’ songs. Far cry from some of Chesney’s songs from the early Millennium. The last page of the album’s liner booklet states that the whole CD is dedicated to a friend of Chesney’s who passed away. It’s a beautifully written note – sad nonetheless – and explains the somber mood of this CD. We can only hope Mr. Chesney feels better and happier with his next CD. He is an excellent singer, songwriter and we love to listen to him. Maybe live some of those “happier” songs again.